President Emmanuel Macron of France is billed to visit Nigeria in early July this year and is expected to address the joint session of the National Assembly, Ambassador of France to Nigeria, Denys Gauer, has said. 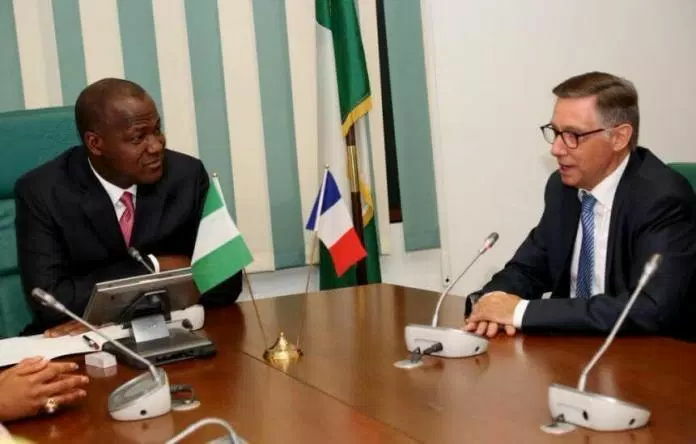 Speaking when he paid a visit to the Speaker of the House of Representatives, Yakubu Dogara, at the National Assembly, Gauer said President Macron has interest in the future and development of Nigeria. He also said whereas relations between the two countries in the last few years have centred on security, Macron hoped to use the visit to further deepen relations with Nigeria especially in areas such as youths, culture and creativity. Responding, Dogara said members of House of Representatives and indeed the National Assembly would want to listen to the French president whom he described as “a man of our generation. “He has brought a lot of youthful zest, dynamism, charisma and appeal to French politics and we will want to yield the floor to him,” Dogara said. The Speaker also commended the French Government for assisting Nigeria in the fight against Boko Haram terrorists and pledged to give expeditious passage to all bilateral agreements that will be signed between Nigeria and France during Macron’s visit.